In March 2011 a mag 9, one of the biggest earthquake ever recorded struck Honshu on the Japanese north east coast causing a tsunami, the deaths of 18,000 souls and crippling the now infamous Fukushima Nuclear Plant. Since that day the stricken plant has been leaking 300 tons of radioactive water into the Pacific Ocean which is nearly a million tons, TEPCO (Tokyo Electric Power Company) claims it will take at least another 40 years to fix the problem, which, give or take, will be another 50 million tons of radioactive water leaked into the Pacific, incidentally the technology to fix the Fukushima melt down has not yet been invented. In June 2011, a mysterious illness appeared off the coast of Washington state which began killing star fish at an alarming rate, the illness was dubbed sea star wasting syndrome, the sea stars were literally tearing their own limbs from their body. The ailment seems to hit starfish the hardest, with smaller numbers of sea urchins and sea cucumbers reported falling to it. No one knows what percentage of the West Coast’s starfish is affected but in some areas they've been wiped out. This was the first clue the all was not well in the beautiful west coast of America. Since June of 2013 the entire west coast of North America, Canada and Mexico included, have experienced massive die offs of all kinds of creatures. Sea turtles, whales, sea lions, birds, fish, star fish, dolphins and a whole host of other marine life are dying in incredible numbers and the experts don’t know why. In the winter of 2015 blue-footed diving seabirds called Cassin’s auklets, had been washing up dead by the thousands on beaches from San Francisco to Alaska, it is thought more than 250,000 died from lack of food. There is no fish out there, he federal government has issued a disaster declaration for Alaska's pink salmon fishery and several other salmon and crab fisheries along the West Coast. Gov. Bill Walker requested the declaration after last year's pink salmon harvests in Kodiak, Prince William Sound, Chignik and lower Cook Inlet came in far below forecast, the Alaska Journal of Commerce reported. The estimated value of Kodiak's catch in 2016 was about $2 million, compared to a five-year average of $14.6 million. The disaster declaration granted by U.S. Secretary of Commerce Penny Pritzker on Wednesday gives Kodiak and the other Alaska fisheries the ability to seek disaster relief assistance from Congress because of the unexpected large decreases in salmon returns. The collapse of Alaska's salmon fishing is not the only problem hitting the North-West Coast of North America in the last couple of years, the amount of marine and bird life dying in the area is astonishing, as the list below will prove. In November 2016 National Geographic published huge massive Puffin die off: Hundreds of birds are washing up dead on the Pribilof Islands, Alaska, and causing alarm among scientists. They claim it may be linked to climate change. 25th October 2016 – A mass die off of sunflower starfish along the coast of British Columbia, Canada, was reported. On the 28th July 2016 - 300 sea birds were reported to have washed up dead since May in Washington State, America. In July 2016 Alarming number of sea birds was found dead on Victoria beaches, in Canada. On the 17th June 2016 – A mass die off of salmon in fish farms, due to 'toxic algae' in British Columbia, Canada was reported. In January 2016 scientists claimed the Gulf of Alaska seabird die-off is biggest ever recorded after finding another 25,000 dead birds. In November 2015 a report by The federal Department of Fisheries and Oceans claimed millions of B.C. salmon had mysteriously ‘just disappeared’ in troubling year. In October 2015 scientists reported seeing large numbers of dead or sick sea otters turning up in the Kachemak Bay region. In September 2015 scientists reported hundreds of dead walruses were found on a beach area in the northwestern part of Alaska. Also in September Kodiak Island residents were reported a massive number of common murres washing up dead on local beaches. 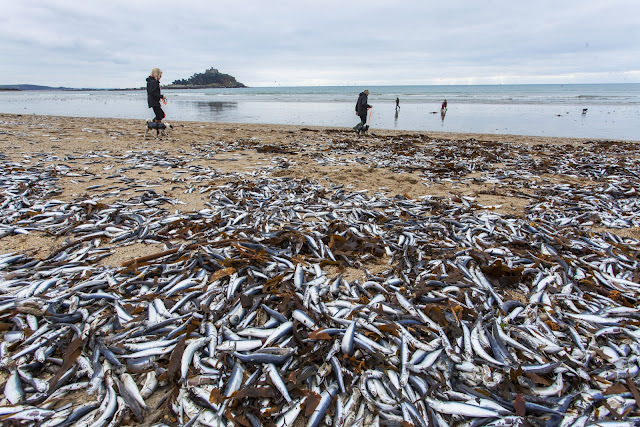 In late August 2015, there were reports of dead fish on Lake Koocanusa, Canada a scene similar to one that occurred on the lake two years ago. It’s not entirely understood what is causing the death of thousands of kokanee salmon. In the same month a lack of oxygen in southern Hood Canal was blamed for killing fish, crab and other marine life, according to Seth Book, a biologist with the Skokomish Tribe who has been monitoring the marine waterway. Through the month of August, Book and other Skokomish staff have observed dead English sole and thousands of dead and dying eel pouts on the beaches. They also have found masses of dead cockles and butter clams, and on Friday, Book said he saw hundreds of crab along the beaches that were trying to get to the surface to breath. In the same week More than 150,000 juvenile steelhead Salmon died in a hatchery on the North Umpqua River in Oregon. August 2015: The discovery of four dead humpback whales in B.C. waters in a single week, shocked scientists just as Alaska was also experiencing a surge of whale deaths. Also in the same week unusually warm water temperatures and low river levels where blamed for killing salmon in the Matanuska and Susitna valleys Alaska. Hundreds of Arctic char, recently stocked by the Alaska Department of Fish and Game, have also gone belly up in Campbell Point Lake, also known as Little Campbell Lake, inside Anchorage's Kincaid Park. Heat was blamed for massive fish die-off at Whatcom Falls hatchery in Washington on August the 6th 2015. Two days earlier The Alaska Maritime National Wildlife Refuge was receiving multiple reports indicating a significant increase in dead and dying birds found on beaches in the Homer area over the last two weeks. In July 2015 it was reported half of Columbia River, Washington State, sockeye salmon were dying due to hot water. ANCHORAGE, Alaska: More dead whales were found in the Gulf of Alaska following the sightings of nine fin whale carcasses in late May and early June. On the 24th of June 1,000 tons of salmon died in a Seafood farm on Vancouver Island in Canada. 19th June 2015: Hundreds of spring Chinook salmon were turning up dead in Oregon rivers. 18th June 2015 –A report claimed 9 endangered whales were found dead during the past few weeks in Alaska. Humanity will not survive this level of radiation without outside help. This is after only 72 years of nuclear radiation. Over 2,000 nuclear tests (air, water, underground) since 1945!! Not good. Oceans die, we die. No, its not Revelation 8:8-9. No Rapture, No peace agreement with Israel and many, No Ezekiel 38-39, 1/3rd of mankind dead. No, we are NOT in Revelation 8. I believe we are in Revelation 3:14, which is just prior to the Rapture of the Church. Listen anonymous. Studying end times eschatology and discerning the times in which we live in and watching as Christ commands us to is a noble and blessed undertaking. Study of end times eschatology and its application as a community serves no purpose when you show up here, merely to state "NO" "WRONG" "NO" instead advance the discussion the way in which the commenter you replied to in such foolish vigor , with scripture and share the conviction behind your opinion that we may learn collectively as peers and gain further understanding on the subject matter at hand. With that said I wish to encourage free and open interpretations and applications as we are counted blessed for seeking fufillment of the Lord and his promises. With that being said I also see Revelation parallel of Ocean die off. In fact the drying of the Euphrates in my opinion suggests these specific fufillments are to take place and us SEE them." when you see these things you will know that I am god" one of the purpose of prophecy is God specifically proving the soverign infallibility of his word. I believe we are meant to SEE these things. And we are commanded to watch by Christ himself as it is entirely within reason that we see the some of the specific visuals in Revelation. The Euphrates drying up requires no cross referencing or interpretation.